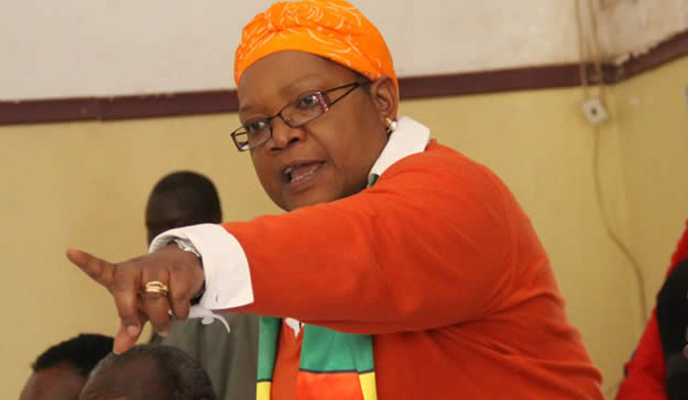 ZIMBABWE – Former vice-president Joice Mujuru’s new party now faces the full might of Zanu PF after it was unveiled last week, a State media columnist believed to be President Robert Mugabe’s spokesperson George Charamba has warned. Higher and Tertiary Education minister Jonathan Moyo recently revealed that Charamba was behind the shadowy Nathaniel Manheru column. “And now that Mujuru has launched, now that Zanu PF has some nuisance to focus on, let us watch Zanu PF at work. “And the starting point is to feed the hungry multitudes, in the process turning adversity to advantage,” Charamba wrote. “But the message is very clear, an opposition that shows fatal weaknesses against a self-distracted Zanu PF, can never hope to survive a Zanu PF crouching for the kill”. Charamba tried to play down the Zanu PF divisions, saying the ruling party could afford to squabble and still survive because the opposition was in disarray. “What is more, divisions which have made Zanu PF e-ready— elections-ready — and not enervated it the same way comparable divisions paralysed and continue to paralyse MDC formations,” he claimed. “Divisions in Zanu PF amount to indulgencies of omnipotence, never the travail of the prostate. Mujuru unveiled the ZimPF party on Tuesday amid growing optimism that a grand coalition of opposition parties could dislodge Mugabe’s stranglehold on power. Meanwhile, political analyst Takura Zhangazha said Charamba’s rant was an acknowledgement that Zanu PF now had a formidable opponent. “It’s almost as though he is relieved his party has a new rival and can focus on that as opposed to internal divisions,” he said. Academic Ibbo Mandaza said Charamba was living in denial because Mujuru’s entry into opposition politics would cause problems for the ruling party. “It is denialism of reality. Zanu PF has imploded and any denial of that will be a lack of tact,” he said. “Mujuru is a headache that they cannot afford to ignore. Meanwhile, ZimPF spokesperson and liberation stalwart Rugare Gumbo said they were ready to confront Zanu PF. “We are fully aware and Mai Mujuru is cognisant of the extent to which Mugabe can go,” he said. Gumbo said Mugabe would be surprised if he though ZimPF was a fly by night outfit. “When Mugabe talks of Zimbabwe People First, second and third, he is giving an indication that he is working on a plan to divide the party. But we will be watching him all the way,” he said. He said the 92-year-old leader might also find it difficult to use the security forces against ZimPF like he does with other opposition parties. “Even the military that they normally use to harass citizens, Mugabe must know that their (soldier) aspirations are as good as those of any citizen,” he said. A year after he was fired from the government and Zanu PF, Mujuru last week announced that he was ready to take Mugabe and Zanu PF head on. Gumbo said criticism by Zanu PF that Mujuru’s choice of venue to unveil the party – Miekles Hotel in Harare – would not resonate with the grassroots, were an indication the ruling party was desperate. “Those comments should be dismissed with the contempt they deserve,” he said. “The Zanu PF administration took over many colonial relics; they are still using Munhumutapa Building the seat of the colonial government. “They should have destroyed Parliament building at independence because in it were all colonial laws unjust to our people passed. “Mugabe uses cars and all sorts of paraphernalia at many occasions that were used by Ian Smith (last Rhodesian Prime Minister) and his predecessors. Mugabe has been accused of intolerance in his treatment of opponents as he tends to resort to violence and arbitrary arrests.